For the German painter, see Fritz Lang (artist). 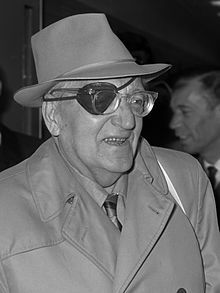 Friedrich Christian Anton "Fritz" Lang (December 5, 1890 – August 2, 1976) was an Austrian-German-American filmmaker, screenwriter, and occasional film producer and actor. One of the best-known émigrés from Germany's school of Expressionism, he was dubbed the "Master of Darkness" by the British Film Institute. Lang's most famous films include the groundbreaking futuristic Metropolis (1927) and the also influential M (1931), a film noir precursor that he made before he moved to the United States. Lang was born in Vienna as the second son of Anton Lang (1860–1940), an architect and construction company manager, and his wife Pauline "Paula" Lang née Schlesinger (1864–1920). He was baptized on December 28, 1890, at the Schottenkirche in Vienna. Lang's parents were of Moravian descent and practicing Roman Catholics. His parents (his mother, Jewish born, converted to Roman Catholicism) took their religion seriously and were dedicated to raising Fritz as a Catholic. Lang frequently had Catholic-influenced themes in his films. Late in life, he described himself as "born Catholic". At the outbreak of World War I, Lang returned to Vienna and volunteered for military service in the Austrian army and fought in Russia and Romania, where he was wounded three times. While recovering from his injuries and shell shock in 1916, he wrote some scenarios and ideas for films. He was discharged from the army with the rank of lieutenant in 1918 and did some acting in the Viennese theater circuit for a short time before being hired as a writer at Decla, Erich Pommer's Berlin-based production company. Lang's writing stint was brief, as he soon started to work as a director at the German film studio UFA, and later Nero-Film, just as the Expressionist movement was building. In this first phase of his career, Lang alternated between films such as Der Müde Tod ("The Weary Death") and popular thrillers such as Die Spinnen ("The Spiders"), combining popular genres with Expressionist techniques to create an unprecedented synthesis of popular entertainment with art cinema. 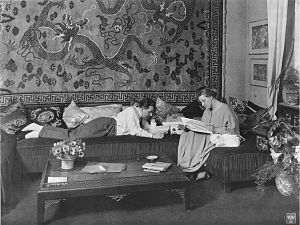 In 1920, Lang met his future wife, the writer Thea von Harbou. She and Lang co-wrote all of his movies from 1921 through 1933, including Dr. Mabuse, der Spieler (Dr. Mabuse the Gambler; 1922), which ran for over four hours in two parts in the original version and was the first in the Dr. Mabuse trilogy, the five-hour Die Nibelungen (1924), the famous 1927 film Metropolis, and the science fiction film Woman in the Moon (1929). Metropolis went far over budget and nearly destroyed the Ufa which was bought by right-wing businessman and politician Alfred Hugenberg. It was a financial flop as well as his last silent films Spies (1928) and Woman in the Moon produced by Lang's own company. In 1931 independent producer Seymour Nebenzahl hired Lang to direct M for Nero-Film. His first "talking" picture, considered by many film scholars to be a masterpiece of the early sound era, M is a disturbing story of a child murderer (Peter Lorre in his first starring role) who is hunted down and brought to rough justice by Berlin's criminal underworld. M remains a powerful work; it was remade in 1951 by Joseph Losey, but this version had little impact on audiences, and has become harder to see than the original film. During the climactic final scene in M, Lang allegedly threw Peter Lorre down a flight of stairs in order to give more authenticity to Lorre's battered look. Lang, who was known for being hard to work with, epitomized the stereotype of the tyrannical German film director, a type embodied also by Erich von Stroheim and Otto Preminger. His wearing a monocle added to the stereotype. In the films of his German period, Lang produced a coherent oeuvre that established the characteristics later attributed to film noir, with its recurring themes of psychological conflict, paranoia, fate and moral ambiguity. At the end of 1932, Lang started filming The Testament of Dr. Mabuse. Adolf Hitler came to power in January 1933, and by March 30, the new regime banned it as an incitement to public disorder. Testament is sometimes deemed an anti-Nazi film as Lang had put phrases used by the Nazis into the mouth of the title character. Lang was worried about the advent of the Nazi regime, partly because of his Jewish heritage, whereas his wife and screenwriter Thea von Harbou had started to sympathize with the Nazis in the early 1930s and joined the NSDAP in 1940. They soon divorced. Lang's fears would be realized following his departure from Austria, as under the Nuremberg Laws he would be identified as a Jew even though his mother was a converted Roman Catholic, and he was raised as such. According to Lang, propaganda minister Joseph Goebbels called Lang to his offices to inform him that The Testament of Dr Mabuse was being banned but that he was nevertheless so impressed by Lang's abilities as a filmmaker (especially Metropolis), he was offering Lang a position as the head of German film studio UFA. Lang had stated that it was during this meeting that he had decided to leave for Paris – but that the banks had closed by the time the meeting was over. Lang has stated that he fled that very evening. This statement has been found wrong after his passport of the time showed that he travelled a few times during 1933 to and from Germany, where he got his divorce from Thea von Harbou, who stayed behind, late in 1933. Lang finally left Berlin on 31 July 1933, four months after his meeting with Goebbels and supposed dramatic escape. He moved to Paris. In Hollywood, Lang signed first with MGM Studios. His first American film was the crime drama Fury (1936), which starred Spencer Tracy as a man who is wrongly accused of a crime and nearly killed when a lynch mob sets fire to the jail where he is awaiting trial. From the beginning Lang was struggling with restrictions in the US. Thus, in Fury he was not allowed to represent black victims in a lynching scenario or to criticize racism. Because of his anti-Nazi films and his acquaintance with Brecht and Hanns Eisler, he came into the field of view of the Communist hunter Joseph McCarthy. Lang became a naturalized citizen of the United States in 1939. He made twenty-three features in his 20-year American career, working in a variety of genres at every major studio in Hollywood, and occasionally producing his films as an independent. Lang's American films were often compared unfavorably to his earlier works by contemporary critics, but the restrained Expressionism of these films is now seen as integral to the emergence and evolution of American genre cinema, film noir in particular. Lang's 1945 film Scarlet Street is considered a central film in the genre. One of Lang's most famous films noir is the police drama The Big Heat (1953), noted for its uncompromising brutality, especially for a scene in which Lee Marvin throws scalding coffee on Gloria Grahame's face. As Lang's visual style simplified, in part due to the constraints of the Hollywood studio system, his worldview became increasingly pessimistic, culminating in the cold, geometric style of his last American films, While the City Sleeps (1956) and Beyond a Reasonable Doubt (1956). Finding it difficult to find congenial production conditions and backers in Hollywood, particularly as his health declined with age, Lang contemplated retirement. The German producer Artur Brauner had expressed interest in remaking The Indian Tomb (from an original story by Thea von Harbou, that Lang had developed in the 1920s which had ultimately been directed by Joe May). So Lang returned to Germany, to make his "Indian Epic" (consisting of The Tiger of Eschnapur and The Indian Tomb). Following the production, Brauner was preparing for a remake of The Testament of Dr. Mabuse when Lang approached him with the idea of adding a new original film to the series. The result was The Thousand Eyes of Dr. Mabuse (1960), whose success led to a series of new Mabuse films, which were produced by Brauner (including the remake of The Testament of Dr. Mabuse), though Lang did not direct any of the sequels. The Thousand Eyes of Dr. Mabuse can be viewed as the marriage between the director's early experiences with expressionist techniques in Germany with the spartan style already visible in his late American work. Lang was approaching blindness during the production, and it was his final project as director. In 1963, he appeared as himself in Jean-Luc Godard's film Contempt. On February 8, 1960, Lang received a star on the Hollywood Walk of Fame for his contributions to the motion picture industry, located at 1600 Vine Street. Lang died from a stroke in 1976 and was interred in the Forest Lawn – Hollywood Hills Cemetery in the Hollywood Hills of Los Angeles. While his career had ended without fanfare, Lang's American and later German works were championed by the critics of the Cahiers du cinéma, such as François Truffaut and Jacques Rivette. Truffaut wrote that Lang, especially in his American career, was greatly underappreciated by "cinema historians and critics" who "deny him any genius when he 'signs' spy movies ... war movies ... or simple thrillers." Filmmakers that were influenced by his work include Jacques Rivette and William Friedkin. The Academy Film Archive has preserved a number of Lang's films, including Human Desire, Man Hunt, and The Art Director. ^ Kürten, Jochen (December 4, 2015). "Born 125 years ago: Celebrating the films of Fritz Lang". Deutsche Welle. Retrieved November 18, 2017. ^ Obituary Variety, August 4, 1976, page 63. ^ "Fritz Lang: Master of Darkness". British Film Institute. Archived from the original on December 18, 2008. Retrieved January 22, 2009. ^ "Architekturzentrum Wien". Architektenlexikon.at. Retrieved March 6, 2010. ^ Ott, Frederick W. (1979). The films of Fritz Lang (1st ed.). Secaucus, NJ: Citadel Pr. p. 10. ISBN 0806504358. Retrieved January 19, 2018. Lang's father was a native of Vienna, born in the Roman Catholic parish of Alservorstadt in 1860. His mother Paula was Jewish, a Catholic convert, born in 1864 in the city of Brunn (Brno), the capital of Moravia. ^ Patrick Mcgilligan (1998). Fritz Lang: The Nature of the Beast. St. Martin's Press. p. 477. ISBN 9780312194543. In the final years of his life, Lang had written, in German, a 20- to 30-page short story called "The Wandering Jew." It was "a kind of fable about a Wandering Jew," according to Pierre Rissient. After Lang's death, Rissient asked Latte [Fritz Lang's third wife] if he might arrange for its publication. "No," she replied, "because Fritz would want to be known as an atheist." ^ Lang, Fritz. Fritz Lang: Interviews. p. 163. ^ Tom Gunning, British Film Institute (2000). The films of Fritz Lang: allegories of vision and modernity. British Film Institute. p. 7. ISBN 9780851707426. Lang, however, immediately cautions Prokosh, 'Jerry, don't forget, the gods have not created men, man has created the gods.' This is more than a simple statement of Feuerbach-like humanism or atheism. ^ "The religion of director Fritz Lang". Retrieved January 22, 2009. ^ "Fritz Lang Tells the Riveting Story of the Day He Met Joseph Goebbels and Then High-Tailed It Out of Germany". Open Culture. April 28, 2015. Retrieved March 29, 2018. ^ Hughes, Howard (2014). Outer Limits: The Filmgoers' Guide to the Great Science-fiction Films. NY: I.B.Tauris. p. 1. ISBN 1780761651. Retrieved January 22, 2015. ^ Letort, Delphine; Lebdai, Benaouda, eds. (2018). Women Activists and Civil Rights Leaders in Auto/Biographical Literature and Films. Cham, Switzerland: Springer International Publishing. p. 98. ISBN 978-3-319-77081-9. Retrieved September 7, 2018. ^ Scott, Ellen C. (2015). Cinema Civil Rights: Regulation, Repression, and Race in the Classical Hollywood Era. Rutgers University Press. p. 1736. ISBN 978-0-8135-7137-9. Retrieved September 7, 2018. ^ Plass, Ulrich (Winter 2009). "Dialectic of Regression: Theador W Adorno and Fritz Lang". Telos. 149: 131. ^ Gold, H. L. (December 1959). "Of All Things". Galaxy. p. 6. Retrieved June 15, 2014. ^ "Fritz Lang | Hollywood Walk of Fame". www.walkoffame.com. Retrieved June 11, 2017. ^ "Fritz Lang – Hollywood Star Walk – Los Angeles Times". projects.latimes.com. Retrieved June 11, 2017. ^ Krebs, Albin (August 3, 1976). "Fritz Lang, Film Director Noted for 'M,' Dead at 85". The New York Times. Retrieved January 22, 2009. Friz Lang, the Viennese-born film director best known for "M", a terrifying study of a child killer, and for other tales of suspense, died yesterday in Los Angeles at the age of 85. He had been ill for some time, and had been inactive professionally for a decade. ^ Dixon, Wheeler Winston (1993). Early Film Criticism of Francois Truffaut. Indiana University Press. pp. 41–42. ISBN 0253113431. Michaux, Agnès [fr]. "Je les chasserai jusqu'au bout du monde jusqu'à ce qu'ils en crèvent," Paris: Éditions n°1, 1997; ISBN 2-86391-933-4. McGilligan, Patrick. Fritz Lang: The Nature of the Beast; New York: St. Martins Press, 1997; ISBN 0-312-13247-6. Schnauber, Cornelius. Fritz Lang in Hollywood; Wien: Europaverlag, c1986; ISBN 3-203-50953-9 (in German). Shaw, Dan. Great Directors: Fritz Lang. Senses of Cinema 22, October 2002. Youngkin, Stephen (2005). The Lost One: A Life of Peter Lorre. University Press of Kentucky. ISBN 0-8131-2360-7. – Contains interviews with Lang and a discussion of the making of the film M.
Wikimedia Commons has media related to Fritz Lang.